The third and final day of the Event #45: $1,000 No-Limit Hold'em of the 2014 World Series of Poker restarted with 11 players remaining. 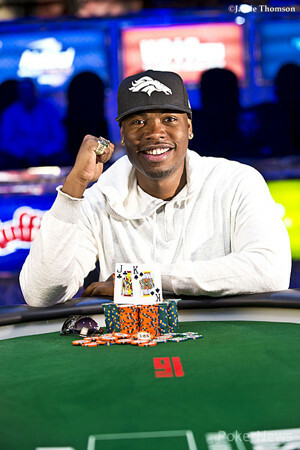 Ultimately it was Will Givens who emerged victorious for a payday of $306,634 after six levels of play. Just one week ago, Givens finished fourth in Event #33 after entering the final table as chip leader. Givens defeated start-of-day chip leader Angela Prada-Moed heads-up after a short but intense battle. Prada-Moed scored a career-high payday of $189,632 and reached her second final table after a fourth-place finish in the 2012 $1,000 No Limit Hold'em - Ladies Championship. Day 3 started with a bang after Paul Sokoloff doubled up through Terik Brown in the first hand. Brown would bow out shortly after in eleventh place. The second woman among the finalists, Kim Ng, ran with into the of Givens and was eliminated in tenth place. The action continued at a high pace and Loren Klein never recovered from a huge double up of Duy Ho through him to hit the rail in ninth place in Hand #11. Likewise, Ivan Saul lost a big pot and was then all in short-stacked in Hand #13 to bust in a three-way pot with . Dmitrii Shchepkin was at risk with and improved on the flop against the of Prada-Moed, but one of the over cards on the river resulted in his elimination in seventh place for $38,423. Prada-Moed was also responsible for the next bustout in Hand #23 when a king-high bluff of Ho went wrong. Down to five players, the action was moved to the ESPN Feature Stage and Patrick Curzio joined the rail in fifth place after his inferior ace-kicker failed to improve against the of Givens. Half an hour later, David Hass lost a coinflip with against the pocket fives of Prada-Moed and he had to settle for fourth place. Three-handed, Sokoloff was all-in and at risk several times, but it would take until Hand #145 to see him bow out in third place after losing a coin flip against Givens, who clearly dominated in the late stages of the final table. Despite three double-ups for Prada-Moed, she could never retake the lead, and in the fourth crucial confrontation, Givens dodged a flush draw and his rail exploded in celebration. That's it from Event #45. Stay tuned and check out the ongoing PokerNews action and live updates from Day 3 of the $50,000 Poker Players' Championship. 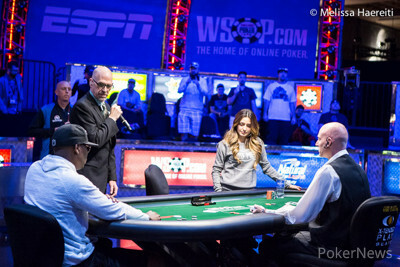 Will Givens raised to 100,000 and Angela Prada-Moed called to see the flop. Prada-Moed moved all in and Givens called after some consideration. Givens got it in ahead and had to fade clubs and queens. The turn changed nothing and on the river, the rail erupted in ecstasy. Prada-Moed was eliminated in second place and Givens picked up his first golden bracelet after coming very close one week ago. Hand #173: Will Givens received a walk. Hand #174: Givens raised to 100,000 and Angela Prada-Moed moved all in. Givens called and said, "OK, I gamble." Prada-Moed flopped Broadway on the flop and both the turn and the river blanked; the short-stack doubled through. Hand #175: Givens received a walk. Hand #169: Will Givens received a walk. Hand #170: Givens raised to 100,000 and picked up the pot. Hand #171: Another walk for Givens. Hand #172: Givens moved all in and Angela Prada-Moed folded. Hand #161: Angela Prada-Moed raised to 100,000 and Will Givens made the call. The flop was and Givens bet 115,000. Prada-Moed raised to 250,000 and Givens called. The fell on the turn, Givens bet 275,000 and Prada-Moed folded. Hand #162: Givens raised to 100,000 and Prada-Moed made the call. The flop was and both players checked. The turn was the and Prada-Moed checked. Givens bet 125,000 and Prada-Moed called. The river was the and Prada-Moed checked. Givens bet 500,000 and Prada-Moed called, but mucked after Givens tabled for three aces. Hand #163: Givens received a walk. Hand #164: Givens raised to 100,000; Prada-Moed reraised all in and Givens folded. Hand #165: Givens received a walk. Hand #166: Givens moved all in and Prada-Moed folded. Hand #167: Prada-Moed moved all in and Givens folded. Hand #156: Will Givens raised to 100,000 and got a call from Angela Prada-Moed. They checked the flop and Prada-Moed took it down after the turn with a bet of 100,000. Hand #157: Prada-Moed limped and Givens checked. 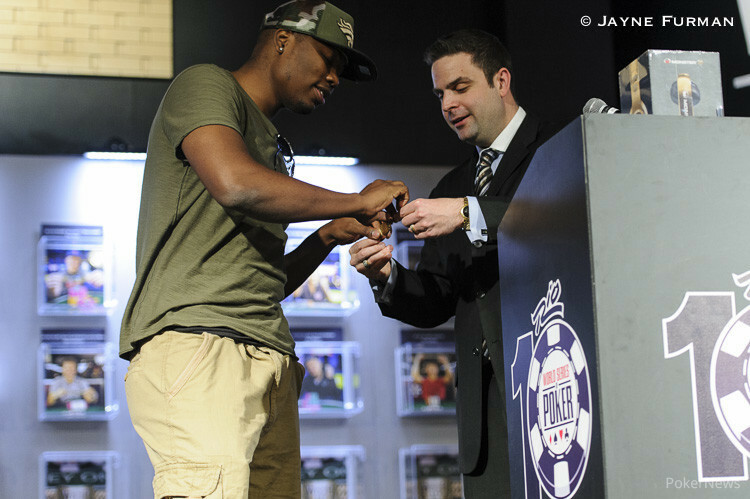 The flop was checked through and Givens won the pot with a bet of 50,000 after the appeared on the turn. Hand #158: Givens raised to 100,000 and won the pot. Hand #159: Givens was given a walk. Hand #160: Next raise from Givens to 100,000 and a fold by Prada-Moed. Hand #151: Angela Prada-Moed raised to 100,000 and got a call from Will Givens. On the flop both players checked. They also checked the turn and then Prada-Moed bet 220,000 after the river to take down the pot. Hand #152: Givens raised to 100,000 and enforced a fold. Hand #153: Givens got a walk. Hand #154: Givens raised to 100,000 and called the three-bet to 250,000 by Prada-Moed. On the flop, Prada-Moed checked and then folded when Givens made it 300,000 to go. Hand #155: Prada-Moed raised to 100,000 and then called all in for 980,000 when Givens put her all in. The board completed with a sweat and Prada-Moed is still in it to win it. Hand #146: Will Givens raised to 100,000 and Angela Prada-Moed called. The flop was and Prada-Moed checked. Givens bet 80,000 and Prada-Moed folded. Hand #147: Angela Prada-Moed raised to 100,000, Will Givens three-bet to 275,000 and Prada-Moed made the call. The flop was and Givens bet 215,000. Prada-Moed raised to 580,000 and Givens reraised all in. Prada-Moed folded and Givens took a commanding chip lead. Hand #148: Will Givens raised to 100,000 and Prada-Moed moved all in for 735,000. Givens quickly called and turned up . Prada-Moed had and was at risk and in trouble. The flop was and the turn brought the to give Prada-Moed two pair and the lead. The river was the and Prada-Moed doubled to stay alive. Hand #149: Angela Prada-Moed called, Will Givens raised to 100,000 and Prada-Moed folded. Hand #150: Will Givens raised to 100,000 and Prada-Moed made the call. The flop was . After unknown action on the turn, the river came the . Prada-Moed checked, Givens bet 250,000 and Prada-Moed folded. More to Vegas Than Poker?